I wasn’t a voracious eater as a kid, but I was a voracious reader. I read books and stories, sure, but also street signs, cereal boxes, magazines, billboards, and ketchup labels. And cookbooks, like my mother’s Joy of Cooking. I read them as if they were storybooks. Each recipe told a tale — the ingredients were the characters, the preparation was the plot. Each recipe was a total, page-turning thrill. Take beating egg whites — could the slimy, transparent stuff at the bottom of the bowl really whip up into something huge, white, and fluffy? 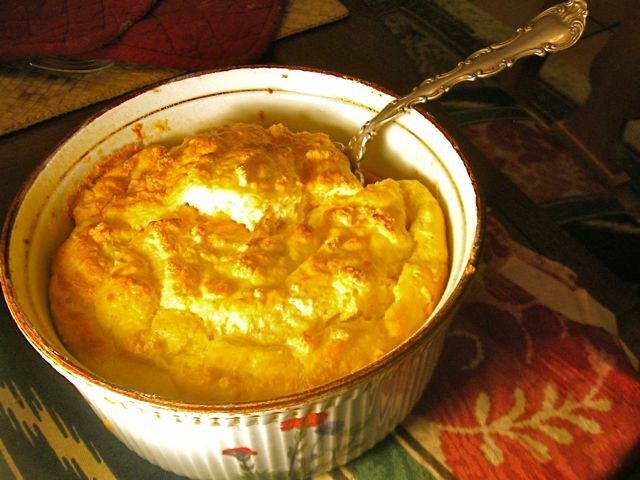 And how could the egg whites lift and rescue the cheese sauce for the soufflé? Would they all live happily ever after? No way! It would all go wrong! The mysteries of what happened in the kitchen had to be plumbed. I pattered around my mother when she made dinner. I watched. I stuck my finger in things (sorry, Mom). I got underfoot. For my fifth birthday, she and my dad staged an intervention — they gave me a Suzy Homemaker Easy-Bake Oven. The name alone is so incredibly offensive and off-putting, but I didn’t know, and who cared? It was a real oven! At least, that’s what it purported to be. Ah, the first of many disappointments on the road of life. In fact, it turned out to be little more than a box with an interior lightbulb. In terms of cooking, it did nothing. Bake dinner in it? Don’t make me laugh. (Even as a kid, I was a tough sell.) I quickly moved on to the real deal and invaded the kitchen. I couldn’t take a cheese soufflé on faith alone. I had to find out firsthand. I made my first one — Cheddar — when I was nine. And wow —  the egg whites really whipped. The soufflé really did rise. Happy ending! And it made a terrific lunch, too — fluffy and herby with plenty of cheese appeal. By the time I was 10, I was a soufflé pro, and birthday gifts included a copper soufflé dish, an apron, and a set of whisks. In other words, my family fed my addiction. My hunger wasn’t for food, however, but for cookbooks and recipes. I was insatiable, and nothing was off-limits. No one told me one cuisine was better than another (because they aren’t), so I studied them all and came to realize there’s truth to that irritating Walt Disney song — it’s a small world, after all. Chinese dim sum dumplings are very close to Russian pierogi. Romanian mamaliga, Italian polenta, and Mexican tamales are cornmeal porridge translated into three different languages. Every cuisine has its own interpretation of chicken soup. In eastern Europe, it’s scented with dill; in India, it’s spiked with chile and ginger. And in Mexico, it features chile and lime. I tried them all. My kitchen forays were enthusiastic but not tidy. My parents dutifully ate all my efforts and never had their stomachs pumped. My father did blister his tongue on one of my flaming crêpes Suzette, necessitating a trip to the emergency room, but that’s another story, and he says it was worth it. Cooking is indeed worth it. It needn’t be four stars, just sustenance. It’s about taking control, self-empowerment, or whatever term moves you. It helps to come to it as I did, and still try to do, with the pure enthusiasm of a child. Flaming crêpes aside, I still believe cooking combines basic life skill and magic. Plus, it’s a great read with a happy ending.